It takes guts in this time and age to head a musical project without having any presence on the Internet. Endless Void don’t have a homepage, and neither can they be found on Facebook, Soundcloud, Reverbnation, Bandcamp or even Myspace. So what’s the matter with this band currently consisting only of a multi-talent named James Owen who plays all the instruments and sings? To get to the bottom of things, we have to travel thirty years into the past, where he was a member of two heavy metal bands (After Forever, Aragon) that apparently were quite promising but never recorded any music. In 1985 he founded Endless Void, whose line-up was changing all the time before a first EP, Final Doom, was finally released in 2008. Four years later James Owen is back with a second EP, titled Apparitions, and recorded entirely by himself. He even seems to be playing actual drums, unlike many other solo artists who prefer to rely on beat machines. Maybe Mr Owen is a technophobe or a Luddite who doesn’t want to be bothered with modern technology. He must be about fifty years by now, so that might explain this anachronistic attitude. But that doesn’t mean that Apparitions is a bad listening experience! It seems as if Endless Void hasn’t changed its stylistic orientation since the mid-Eighties when the band was founded. Let’s simply call the genre proto doom. This doesn’t sound like the many different brands of modern doom metal, be it the funereal, the gothic or the drone kind. Instead this owes much more to the sound of the NWOBHM, and I felt reminded more than once of the sound I heard when I was listening to the seminal New Wave of British Heavy Metal '79 Revisited compilation back in the early Nineties. There are traces of Black Sabbath, and even of early Motörhead (especially the guitar sound), but more strongly are the influences of bands like Witchfinder General, Diamond Head and many other mostly forgotten bands of the long past era. Even the recording quality reminds of these early pioneer days. Forget the current loudness wars, as this EP doesn’t have this overdrive sound so frequent in today’s glossy metal bands. This is pure manual labour, and while it is neither original nor modern at all, it is still the music that James Owen loves to play, and that becomes so obvious when listening to Apparitions. The four songs make it to twenty minutes, and while many a nostalgic metalhead would have liked more, they should still not complain as the songwriting quality is rather superior. The opener R.I.P. / March Of The Dead is a straight rocking piece of hard rock / heavy metal with nasal vocals that remind a little of Ozzy Osbourne. There is a dark atmosphere prevalent, but more akin to occult proto metal bands than to straight out Satanist black metal freaks. Spiritualistic Medium continues in that same vein, and is with four minutes the shortest track featured on the EP. Bereaved is the song guilty of having me come up with the aforementioned Motörhead parallels, even though the bass guitar doesn’t have the special gnarly sound of Lemmy Kilmister’s divine playing. 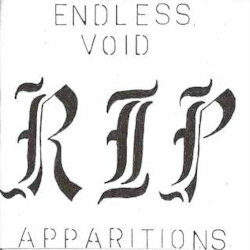 Apparitions & The Undertaker ends the EP, and this track starts and ends with an organ part that is probably supposed to sound creepy but ends up feeling a little silly, a little bit like the organs on an ice hockey rink. But the song itself is quite cool again, with downtuned yet not too distorted guitar and pleasant vocals that are quite different from what we get nowadays from most metal bands. James Owens once stated in an interview that he would like to play with real musicians, but that being in a real band makes it hard at times to get your own ideas done. Let’s hope that he will find soon some equally spirited people so that he won’t have to do everything by himself. The seven point rating may not be the highest possible, but don’t forget that this is a demo, and the quality is closer to tape than to current hi-fi standards. It doesn’t really disturb me, but I have to state it so that you have been warned. In a world where everyone tries to sound more and more polished, it’s nice to occasionally come across artists who still sound like the bands sounded when I discovered heavy metal.